The New Car Assessment Program for Southeast Asian Countries (ASEAN NCAP) today released the latest round of test results at the ASEAN NCAP Grand Prix Awards in Kuching, Sarawak – four models make up the set for Q3 2014 testing, which is part of the agency’s move towards a more frequent “test-and-publish” programme following the conclusion of its three-phase pilot project. The Tata Vista, which scored 9.24 points out of a possible 16 in Adult Occupant Protection (AOP), is produced in India and is only available in Indonesia and Myanmar. The agency says that this is the first time a car of Indian manufacturing origin has undergone ASEAN NCAP assessment. Both Honda City and Jazz models that were tested were Thai-built models for the Thailand market, with the six airbags variant scoring five stars, and the two airbag version obtaining four stars. In the AOP rating, the Honda City broke the record score in ASEAN NCAP testing by managing 15.80 points, surpassing the previous high of 15.73 points obtained by the Ford Fiesta. The Jazz scored 15.58 points. The Perodua Axia, meanwhile, has the honour of being the first vehicle in the evaluation programme to be launched into the market with ASEAN NCAP results, and is set to be the most affordable 4-star car (in both AOP and COP) in the ASEAN region, according to the agency. It managed an AOP score of 12.91. Read all about our ASEAN NCAP coverage, including Phase I, Phase II and Phase III test results from the pilot project. A major shortcoming of the ASEAN NCAP is that it still doesn’t take into account side collision safety. The Jazz is superior to the Axia if you factor in a side impact test. Furthermore, the Jazz achieved acceptable results on the IIHS small front overlap test which netted it the Top Safety Pick+ (iirc). No mean feat. Hello, Proton fanboys. Where is your 5 star GSC?? End up just another Sendiri Cakap Sendiri Syok on the mystery GSC. Proton will always be the last to present their result. Need to prepare GSC+ and GSC++ leh. He is one of the most unbias ppl I seen around here. I never call people stupid, idiot, retard, bodoh etc. You don’t buy Toyota you no need get out of Malaysia/Japan. All are about cars. You buy Perodua/Proton, you are not poor or lousy. Real Same L0rrr has no discrimination on car owners. But Proton lousy build quality definitely keep you poorer after being garage’s VIP. Eh, real Same L0rrr, why don’t you register your nick? Keeps people from hijacking your nick for stupid comments, like how kzm always got cloned before paultan.org had this feature. we’re talking PURELY about safety here. why are you ignoring the fact that iriz is safer than axia? 5 star (ANCAP) vs. 4 star (ASEAN NCAP): which one is better? don’t bring in built quality just yet ok. They didn’t say they would take side collisions into account, however the 2 airbag cars are rated at 4 stars only, while with the same number of points the 6 airbag ones are awarded 5 stars. Also please note the Axia got fewer points than both Hondas (which have enough to get a 5 star rating, at least in the frontal impact test). There is no mentioning of side impact = pass, which could mean that it failed and that’s the reason why they only got 4 stars? Why didn’t they mention the failure though? Want to protect Honda? It is all a bit confusing. They’re degraded due to the exclusion of VSC/ESP, Base spec City/Jazz El-cheapoi do not come with VSC/ESP and also only 2-airbags. remember that VSC is a requirement to achieve 5-star NCAP(all NCAP). Well lets take a look at the Australia NCAP test for the previous generation City. As they have yet to test the latest model i can only provide the scores for the previous generation City. The tested car has 6 airbags with ESP equipped. Additional 2 points were awarded for passing the Pole Impact test. This shows that Honda City does score very well especially in the side impact. Not sure what sort of theory you are spouting about protecting Honda here as results shows that there is no such thing. The current model tested under ASEAN NCAP shows a higher front impact score over the older model thus it should be safer and score as high for the side impact. 4 star rating for the base model City is due to exclusion of ESP thus does not qualify for the 5 star rating. Other than that the body structure is still as strong in the base model over the V spec. They actually went one-step furthur in the US in regards to the safety. The pre-production Jazz actually failed in the small overlap test, scoring a poor back in March. Honda went to the extand of stopping the order books and delaying deliveries until a problem is found and they’ve found it…..a simple extra welding in one of the bumper beam(the metal immediately after the plastic bumper front). So it than achieved an ‘acceptable’ ratings in June. 12,000 existing 3rd gen Honda Fit owners in US are notified and a fix can be done by any Honda US SC for free. Its a 30 minute fix that includes replacing the entire front bumper beam. Anyone can explained why its still scored 4 stars even driver head cracked ??? Totally agree with you AVH. The safety in regards to Honda cars is quite admirable. Kadawaji do you know that the current new generation of Honda cars like Jazz, Civic and Accord all were nominated as top safety picks(Jazz) and top safety picks plus (Accord,Civic) under the IIHS. Civic is one of the highest scorer in its segment under Australia NCAP and scored 94% under Euro NCAP. So do you still think ASEAN NCAP is there just to protect Honda??? My friends mother is still in hospital after 1 year due to side impact from another car hitting her Axia. Axia really use paper door only. You open the door and see its 2 fingers thick only. Even motorbike crash on your side also dangerous. Will a large car and a small car perform the same in a collision if both scored the same stars in ASEAN NCAP? We still remember the news where Vios and Waja head on collision. Waja driver died. So much for a C-segment and “stronger” steel. Things can always go wrong. It isn’t written in stone that bigger cars would always protect their occupants well when it collides with a smaller car. Kinematics are very complicated. The fact that it happened that way shows that Proton’s safety package was not as good as it should be. Lousy C segment vs ok B segment. B segment wins. Proton has come a long way since the Waja. Waja already EOL, Vios is still here with innovative zinc roof! I have always thought Preve was one of the safest cars in Msia as was promoted by Proton. Looking at the results even the City scored better then the Preve in adult and child safety. Now i know which car to get for my family. B segment vs B segment, why compare City with Preve? Of course still selling because they can sell. Only idiot stops their best seller model and sells models that not many want to buy. kzm, that isn’t always the case. Some car manufacturers are testing their small cars against large cars. Honda has a testing facility where they crash their small cars, such as the Jazz, against large cars to test structural integrity. Mercedes-Benz does the same with their smart cars, as we’ve seen recently from a smart fortwo crash test against an MB S-class. Comment like this I can accept.. But I get what you mean. The NCAP tests have their limits because it doesn’t account for safety in a collision against a larger vehicle. Yes that what I meant. Car safety is to protect passenger, not engine! Engines, radiator, hood and trunk are all crumple zone to absorb impact. Thus u see Perodua/Toyota/Honda scattered around during crash, and thought it is milo tin. If the impact is not absorbed, it will be transferred to the passenger directly, then u see less damaged car with dead bodies. Too sad a lot of Malaysian (especially those Proton fanboys) don’t understand it. Human life and the engine, which one is more important? Use your brain. I think you mistaken Toyota fanboy with Proton. The last I know, when the preve crashed with engine dropped out, proton fanboy did not says that it’s a tin milo. Unfortunately, others did. Yes, I agree Preve does a good job on this with the engine drop. But how many Preve on the road? How cheap is the Preve? Why do the Proton fanboys have to so proud and syok of nothing while MOST Proton cars on the road now are still Iswara, Wira, Waja, Saga, Persona?? ARE THEY SAFE? Some more Proton build quality cost the current drivers so much changing this and that. You never know when it will break down again. How do you expect them to have enough saving to change to Preve, while they already paid so much to garage? If most of the Preve are in warehouse (because existing drivers have no money to change, those who can afford Preve turn to Toyota/Almera/Honda/Kia), what is point having so awesome safety features with warehouse/showroom car? Current Proton drivers in danger with crap build quality. Prospective buyer turn away from Proton. Proton making lose then ask government aid. Government short of money, increase tax. No one get benefit, why Proton fanboys syok??!! Yes, I do read the incident that engine dropped suddenly in the mid of driving due to unknown reason. Its still danger to all the road users. Its the same philosophy that as long as the campro can mive the tons of object, or as long as turbo added to campro and that is it. SameLorrrrr~ Toyota Altis is safer than Preve/Suprima lorh because the number is far less on the road. In show room only!!! Hahahahaha. Pawned!! if you dont know what is momentum..go ask Mr Google. Mass play a main role for crash test. since speed of the car is same during test, however their momentum are not same. Axia is low on their mass compared to other car..
That’s why modern cars (like Axia, Preve, Vios, City etc) has crumple zone to absorb the impact energy, and reinforced cabin to stand the impact. All crash test done at 60km/h, if your Suprima S kena hit by lorry at 100km/h, you think you can survive? Don’t be naive. I didn’t say Axia can withstand big lorry or high speed impact. Even Ferrari couldn’t. The NCAP show it is doing good (4 star) securing PASSENGER at reasonable speed and impact. Today i personally just witnessed an accident on the federal highway involving a locally made car 10 years ago which does not have ABS or ESP. The said car applied emergency brake, the wheels locked as there were lots of white smoke coming from the tires. The car then lost control and swerved to the left at first but ended up swerve right hard and crashed into construction barriers and was lifted up into the air due to the barriers wedged under the car. As i got to see first hand how a car without ABS and ESP can so easily lose control at speeds of under 60km/h i will never buy a car without the full compliment of safety features ever. My advice to everyone is do not take safety for granted and if you can afford it get a safe car with ABS,EBD,ESP and 6 airbags. good job perodua..2 airbags enough to get 4 stars.. the body must be rigid and strong..bkn tin milo lagi…looks,a pillar not bend..Actually, only town peoples/educated peoples know about safety with 6 airbags ,vsc and so on..if you go to the rural areas, what safety features you want this car to be equipped with ? 2 airbags sudah cukup maa..i bukan beli itu keta 70k ketas punya harga..vios pon ada itu 2 airbags saja. (it’s proven when i join the survey almost all states in Malaysia(except klang valley)..anyway good try from plotong if they want to educate people.if x laku..just waste duit takyat..opss.we’ll see later. if Axia hit with Waja Or the old toyota vios, There’s diff story for the driver and passenger. With no crumple zone designed in Waja, I don’t think so. Check up the crash video between big Volvo 940 with Renault Modus (Myvi size). Size doesn’t matter all the time, it is all about the design. Good video bro.. now2. . Kzm can be a test dummy for Saga BLM. . He can be a dummy too..
yes can no problem…provided that the car that I need to crash has to be lower star same segment or smaller than my car…obviously I havr lower chances to survive with car that has higher star (same segment or above) or crash to bigger car even those car has 1 star.. smaller car I have higher chances to survive provided I wear seatbelt n u have to buy me new car lah. ps: What with same l0rrr comparing old cars? Now we ve to wait for Axia to crash test with you.. sabar ya.. Meanwhile since you ready to die in your BLM.. I suggest you try crash test on your own first.. go crash into a tree at 80kmp. Ok? Make sure you record the test. I ll sponsor you a camera man.. & a coffin too. Asean NCAP no side impact test, that’s why got 4 star. They do side impact tests. They just won’t rate them or publish the results. We dont know that the A-pillar actually buckled or not. The picture shown at time BEFORE rebound. You can check that the dummy has not landed on airbag perfectly. The tire barely left the ground. Iriz got 5 star. Tq. Oh yeah. . Tgk segment lah bro..
Tgk harga juga.. blm berani kasi tau harga. . Booking pon x boleh lagi..
Tp mcm biasa proton macai bw kereta fikir nak accident & half dead trrw. Attitude bro.. attitude. . MIROS said many times dy..
Want 10 stars also can.. drive a tank. Can you control others attitude so that no accident happens? I heard the Iriz can land on the moon and travel to Mars in 15 mins? Only 5 stars? It is so disappointing man! I am expecting 15 stars, since the Proton fanboys are so syok of it. Agreed motorbart..But if a drunk lorry driver collided with you while driving even your super Suprima S.. tell me if you can survive. . Remember. . Paul Walker did not die in a Myvi or Vios.. The point it experts said it dy.. Attitude is the main cause..it didn’t say how many stars you ve..
All tests are under control situations. . & most of modern cars today ve enough safety under normal situation to keep you alive..
& again. . Not after you can provide stat or figures on which car lead to most fatalities. . Please don’t talk kork.. It may end up proton’s.. who knows. Yes, so far Proton has the most fatality cases on Malaysian roads. Partly due to old Proton drivers still remain biggest group in Malaysia public road users. At least I still have higher chance to survive if the collision is not with a lorry. Well goodluck to you, jgn bongkak sgt.. when your time come..it ll come.. even you collide with Myvi kalu nak mampus.. mampus jg.. If you really drive a Preve (due to its FC).. I bet you ride kapchai to work on daily basis.. Be careful. . A Myvi or vios owners may accidentally or not ram on you.. like you said.. you can’t control other’s attitude. But but.. some idiots without figures & stats said Axia is a coffin? ? Here’s some examples. .
Now look who’s talk kork? Motorhead? Hahaha. . Lawaklah. . Typical Protong macai..
Drive a proton. . You ll be immortal. Hahaha. .
U try la.. ni lagi sorg lg bahlol drive fikir nak mampus..
You are RIGHT! They are often BLIND and keep on syok sendiri. We indeed base on fact. Everything figure, reference and facts! Proton Saga in fact is the moving coffin!! saga is bigger than axia, not just overall size but also overall mass. although saga is 3 star and axia 4 star, in head to head collision between them (not against the wall in asian ncap), axia wouldn’t in any advantage of the extra 1 star. the result could be equal. I must admit that the Axia does surprise me. It’s clearly not bad for the price. Sadly ASEAN NCAP has changed the way they display results between the FLX+ and the Axia test, so we can’t 100% compare. They are quite close, but the Axia seems better. Then again the Saga weights more, which is an advantage, and it has a boot. Both cars have their strengths and weaknesses. Keep in mind though that the successor of the Saga will be based on the much safer GSC, so yes, congrats to Perodua for having caught up with a model that’s been on the road for ages and is about to be phased out. Wow, a Proton macai praising Perodua car?? Kadajawi, please comment after the car is launched or tested. No point so fast syok sendiri here. I even heard the GSC can land on aircraft carrier or dive in ocean. But that cannot beat Vios that can fly! Must it always become a personal attack? Axia is byproduct of Daihatsu not perodua, Toyota & Daihatsu made a new entity i.e. Perodua Global thanks to our idiot minister Mustapa Mohamed who signed agrrement to let this company being existed without thinking our fellow Malaysian working in Perodua Manufacturing & Perodua engine, for next month target has been set to make 3000 workers to resign in 2 entities that have been mentioned above, the engine axia is using is not coming from Perodua itself, it came from Astra Daihatsu Indonesia, compared to the old viva engine minor differences is timing chain & aluminium cylinder block, poor old viva use steel cylinder block & timing belt, if this project is not net with their expectation then Alza is next on their list to be taken out from those 2 entities, sad to say those 2 entities are being crushed bit by bit. former perodua worker at CMK aka Perodua engine. By product what? What craps you talking? Minum ketum ka? Yeah.. ok.. by product. . Axia aka Agya is by product? Well ok2.. ikut lu lah org mabuk.. I agree with you.. that’s why I prefer bought P2.. because of “by product” of Daihatsu. .
& guess what. . This by products can fit all parts from Daihatsu. . Only that matters. . I don’t care much about P2 anyway.. fortunately. . P2 making profit & can contribute revenue back to the gov. You want me talk on P1? kau tak bekerja kat P2, sebab tu kau boleh bersembang macam tu. PMSB (R&D, Production, CMK) kena squeeze dengan DMC macam apa tah, terutamanya Morita. Aminar tu puppet DMC je. banyak orang PMSB resign, itu adalah fakta. key player dari R&D, manufacturing & QC side yang dari zaman kancil dulu, ramai yang resign. P2 banyak concentrate kepada P2 Global, PMSB diabaikan. orang kata, bonus nampak tinggi. tapi apa kes orang tu ada pengalaman testing kereta, kau hantar gi kerja admin HR? it is not about P1 in this context, anyway. Please la peyno…dont be so stupid. I also graduated from ITM which has been changed to UiTM years ago. Being head-hunted by many big companies i.e FFM, Gribbles but hei..why must u bring ITM into this. If Asean NCAP still has not gain their own credibility, give them some space, even you start your life as a baby, right? You are not Benjamin Button I supposed. peyno, you are going way too far, man. why must you mention about ITM certs? we are discussing about automotive stuffs. most of us don’t believe in the credibility of ASEAN NCAP. It Asean NCAP is not reliable, then the Proton fanboys has nothing to be proud of!!! How dare you deny their fundamental right to syok of Proton? In fact, the Insight (Japan CBU), Prius (Japan CBU), Civic Hybrid (Japan CBU) all 5 stars in IIHS US. Proton fanboys just diam diam when they came across these. So in a case of MyVi, I really doubt their credibility. This time when Axia result is out. I hardly can assess anything because the picture is not taken at the time where the car rebound (all other results show at rebound). I will wait for them to release crash video for Axia (if there is any). Proton got Australian NCAP, more or less like Euro ones, satisfied? I wonder if the presence of stability control can make the Axia a 5-star ASEAN NCAP holder. you mean even if axia got 14.00 points it still got 4 star because no vsc? Mirage 2airbags, ABS EBD = 4stars Asean Ncap. aXia 2airbags, ABS EBD = 4stars Asean Ncap. Mirage 6airbags, VSC = 5stars Australia ANcap. IF aXia 6airbags, VSC = sure 5 stars macam Mirage also. Need to see the crash test scoring too, you know. It’s not just about how many airbags and VSC. No, Axia won’t get 5 star even with stability control. For Asean NCAP, the crash test must score 14/16 or better to get 5 stars, Axia only achieved 12.91/16. Fair enough. Then Perodua must have skimped a bit on chassis strengthening to make the car more affordable. This sort of test I suspect have very low standard, means it is very easy to score 4-5 stars. Better rely on EuroNCAP test results. Malaysia’s cars can go further beating cars from overseas; korean,Japanese, European car! Just keep support them! Lol this is oni for frontal crash test. Someone please advise me the ratings of the Viva? – my guess would be fairly dismal judging by the recent tragic accidents that included a nurse in Johor. 0-1 stars at most, if it is the 0 or 1 airbag version. The Saga FL got 1 star because of the lack of a passenger airbag. The Almera should have too… they must have pushed the passenger seat aaaaall the way back. The passenger in the Saga must have struck the dashboard, and that is deadly. Which, btw. is a good advice if you drive such a car. Move back. Get as much distance as possible to the front of the car (without leaning back too much, because that may cause you to slide through under the seatbelt…). For the 2 airbag version… if the passenger is crushed to death airbags don’t help. The toughness is to protect people, not to protect engine. Engine, boots, botnets are all crumple zone to absorb impact, thus you see it is fragile and scattered around during crash. Passenger life and the engine, which one is more important to you? Good enough, definitely better than Viva which is a 2002 design.. But Perodua could try harder, with 6 airbags and ESP, at least for high spec models, even better if standardised for all variants..
And ABS on all cars. Proton has closed shop decades ago. P2 have to make it tough, because a car with tiny tires, without VSC and ABS is very easy to skid! Ramai P1 fanboys akan ckap Preve 5 star bla bla. Ye Preve mmg pling perfect. Dgn enjin satu pilihan 1.6 dn jualan seluruh dunia beratus2 ribu (since P1 ckp Preve nk kete global)..beli lah kete yg sgt cantik design die ni. X pun bli Sup Rima. Dpn muke Preve blkang muke lain. Why the picture is not taken at peak crash time? 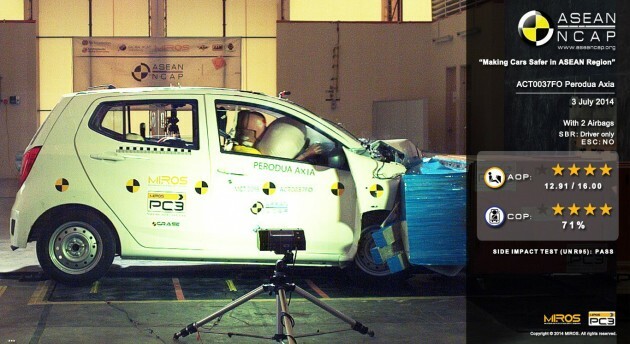 In the picture of axia crash, the dummy clearly does not fully hit the airbags yet. Just a thing for you guys to ponder. This is based on the old Honda City, which gotten 5 stars even though it had 2 airbags. Criteria did not change. The new Honda City with 2 airbags also happens to not have VSA (Honda’s ESC) equipped. If it had ESC but only 2 airbags, it should still have gotten 5 stars. Although most accidents results with front collisions, most dangerous ones are T-collisions. Hehe @same lorr. The Renault modus is called the Savvy in Malaysia. They took that design and altered it for Proton. Very, very safe car that Savvy!! lol, i dont trust this asean ncap crashing local cars. macam main tipu to rate them higher. berapa perodua bayar kat asean ncap ni??? I don’t really understand this…. why the H City and H Jazz with 2 airbags only scored 4 stars ? compared with previous generation with 2airbags scored 5. And why is the Axia Score same 4stars with Jazz but the score quite a big difference. Someone enlighten me pls. H City and Jazz base spec does not come with ESP. Having ESP is a requirement for having the 5 stars. Without ESP a car can only get maximum 4 stars. So the S, S+ spec for Jazz and City has 4 stars while the E and V specs have 5 stars as they have ESP. The previous generation City tested was with 2 airbags and ESP equipped so a 5 star rating is achieved. Another thing to consider is you have to look at the front impact scores for Axia, Jazz and City. Both the Jazz and City still scored significantly higher than Axia although its the base spec version thus its a safer car. To achieve 5 star rating a car must score above 14.00 and with ESP equipped so Axia only has 4 stars even if they equip ESP. It is just the passing mark is lower. So, only 6 stars Asean ancam is acceptable. question, does the most basic one have electric windows or do you have to roll it down.